All donations to Cats R Us are tax deductible, we are a 501(c)3 non-profit organization. We are solely a volunteer organization, no one is paid a salary, so you can feel confident your hard earned money will go only towards the care of our rescued cats. In fact less than 4% of our annual budget goes toward administrative or fundraising expenses. 100% of our income comes from tax deductible donations! If you would like to send us a monetary donation to help our rescued cats please send it to: Cats-R-Us, PO Box 160, Gambrills, MD 21054 or you can donate through our website. We are grateful for monthly donations in any amount because it’s money we can count on every month. 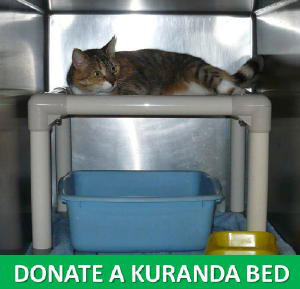 We can always use cat carriers, metal wire type crates, cat trees/furniture, towels, and cleaning supplies. Email us at donate@catsrusrescue.com and we’ll arrange to receive the donation. If you have an old car or boat that you would like to give away, please consider a charitable donation to Cats R Us. Just call (410) 271-3824 if you would like to help. Cats R Us is a proud parter of Bissell Partners For Pets and Lost Pet USA. Please friend/like their social media sites to help support them (and us). 1-800-PetMeds, America’s Largest Pet Pharmacy, sells your cat’s medications for less!